Several epidemiological studies have examined the prevalence and severity of fluorosis in different population using a variety of indices and methods. However, the public health significance of these defects is difficult to quantify, and it is unclear whether the information collected by current methods is of any value in determining the importance of defects as esthetic stimuli. As all indices measuring fluorosis are normative, it has not been possible to reflect the community's perception of cosmetic acceptability. 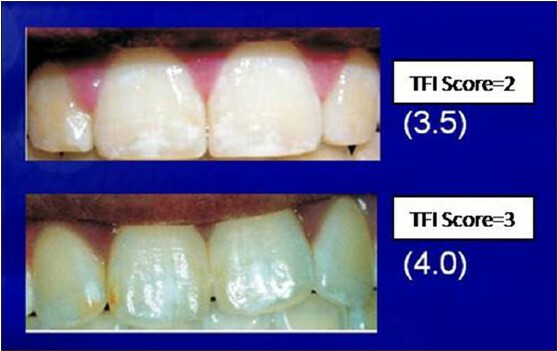 Besides, the currently used indices of dental fluorosis are not suggestive of treatment needs. Furthermore, all current indices for dental fluorosis use ordinal scales and the scores should be considered only as arbitrary points along a continuum of change. Continuous scale is preferable to the ordinal scale as the former has the advantage of showing the positions of different observations relative to each other and demonstrating the extent to which one observation differs from another. These considerations are extremely important when correlation between the severity of fluorosis and the factors associated are studied. Thus, a need to develop a continuous scale to assess the severity of dental fluorosis was felt. As photographs act as strong esthetic stimuli owing to the visual impact they create, it was considered a good idea to assess dental fluorosis on a visual analogue scale (VAS) based on esthetic perceptions of the photographs Further, VAS has the advantage of reflecting self-assessed treatment need and thus provide a picture of the burden of dental fluorosis that needs to be managed by dental health care delivery. To compare the dental specialists' and 1 st year dental graduating students' agreement on perception. The study was carried out following ethical approval by Human Research Review Panel, KM Shah Dental College and Hospital and Ethical Committee, Sumandeep Vidyapeeth, Piparia, Vadodara district (India). The study, cross-sectional in design, was conducted during March to April 2010. The study subjects were divided into two groups comprising of dental specialists and 1 st year undergraduate students of KM Shah Dental College and Hospital. A nonprobability sampling technique was employed to select the dental specialists based on the judgment that specialists belonging to public health dentistry, oral medicine and diagnosis, pedodontics, conservative dentistry and prosthodontics were well-versed with diagnosis and/or treatment modalities of dental fluorosis. The first year dental graduating students were purposively chosen to represent the lay population who supposedly had no theoretical or clinical knowledge of fluorosis. All the eligible study subjects were informed the purpose and nature of the study at the outset. They were handed over a participant information sheet each, and an informed written consent was obtained from each of the participants. Only those willing to participate and sign an informed consent form were included in the study. First year dental graduating students whose parents or relatives were dentists were excluded as their inclusion might hinder the simulated lay group. Thirty-one dental specialists belonging to public health dentistry, oral medicine and diagnosis, pedodontics, conservative dentistry and prosthodontics at KM Shah Dental College and Hospital, Piparia participated in the study. Thirty-one 1 st year dental graduating students were selected by simple random sampling technique (lottery method) to equalize the number of specialists yielding a total sample size of 62. Thirty-six photographs comprising of original clinical photographs of patients with fluorosis, photographs from textbooks, color Atlas More Details and internet sources, displaying varying severities of fluorosis in maxillary anterior teeth, covering the entire range of the fluorosis severity were selected. Photographs displaying anterior teeth irregularity, anterior teeth filling or anterior teeth stains (nonfluorotic) were excluded. The photographs were standardized for uniform dimensions, orientation, brightness, contrast and resolution using adobe photoshop software. All the photographs also exhibited uniform coverage showing from maxillary right lateral incisor-maxillary left lateral incisor. TFI score was given to all the photographs by the principal investigator. Prior to the start of the study, the principal investigator underwent half-day' training session that included the scores and criteria of TFI and a slide presentation depicting photographs matched to the severity scores according to TFI. After the training session, ten photographs (not included in the study) were rated independently by both the principal investigator (TK) and one of the co-authors. The principal investigator was calibrated against the latter (κ = 0.93). Intra-examiner reliability was performed the next day on five photographs randomly chosen from the previous day's photographs, and reliability was found to be excellent (κ = 0.98). Photographs were numbered, randomly arranged and distributed to participants. Participants were blinded to the dental condition under investigation to prevent bias. They were requested to rate their esthetic perception of a dental condition in each photograph on the corresponding VAS provided on a separate recording sheet. A 10 cm VAS with defined anchors at each end to indicate the extremes of perception of the condition (0 denoted "not bad at all; never mind" and 10 denoted "worst that can happen; definitely needs extensive treatment" was used. The mark placed by the rater on the scale was taken as the quantum of his perception at that time. The intensity of the perception was scored by measuring the distance from the lower end of the scale to the place of the rater's marking on the scale. The photographs acted as visual indicators to guide the rater. The mean values of the VAS scores for the photographs were used to construct a VAS for fluorosis. Five participants from the expert group and five participants from lay group re-recorded the VAS after 1-week for test of intra-examiner reliability. SPSS version 17 (SPSS Inc.,Chicago, IL,U.S.A) was used for statistical analysis. Intra-class correlation was chosen as a measure of reliability (inter-rater and intra-rater reliability) as found suitable for continuous outcome variable. 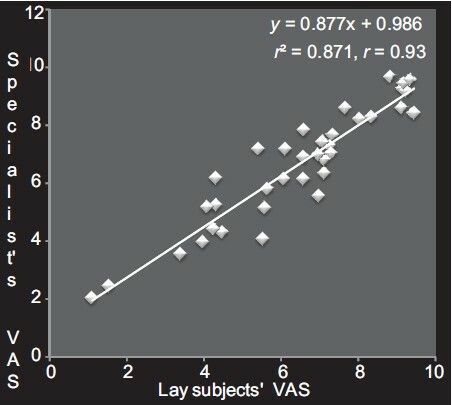 VAS was validated against TFI using Spearman's rank correlation. Significance level and confidence interval were set at 5% and 95%, respectively. A VAS for dental fluorosis could be constructed by mean scores given to each of the photographs by the raters. The photographs were so placed on a continuum along the 10 cm VAS as depicted in [Figure 1], [Figure 2], [Figure 3], [Figure 4], [Figure 5]. 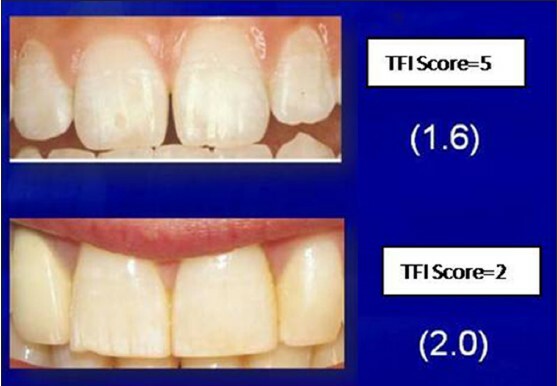 Inter-rater reliability testing showed good agreement that was statistically significant on VAS scores for dental fluorosis depicted by the photographs (intra-class correlation coefficient [ICC] = 0.5877) as presented in [Table 1]. Mean VAS scores of dental specialists and the lay group for all the photographs were analyzed for correlation using ICC; [Figure 6] is a correlation diagram of dental specialists' and lay groups' VAS scores. High correlation was observed (r = 0.93) and strength of correlation expressed by r2 reflected that 87.1% of the times, change in VAS score of dental specialists could be explained by that of the lay group. Intra-rater reliability test revealed high ICC values for both lay group and dental specialists [Table 2] demonstrating the high reproducibility of the constructed VAS for fluorosis. The VAS was validated against the TFI using Spearman's rank correlation, and moderate correlation (ρ = 0.725) was observed, which was statistically significant [Table 3]. The study succeeded in developing a VAS for dental fluorosis that is a continuous scale with discrete numerical values given to each of the photographs depicting a different grade of severity of fluorosis. The advantage of this scale is that it has been constructed based on subjective ratings with no set criteria which make it ready to use subjective scale. Subjective nature is of utmost value in scales that measure dental conditions of esthetic concern. The strength of the developed scale is its flexibility. That is, in case of fluorosis conditions that may not exactly resemble any of those depicted in the photographs, the scale can still act as a guide to the rater and the rater is free to place the given condition on the scale, and a new discrete numerical may be used to indicate the same. In this manner, even the conditions not described by any of the photographs in the study can also be easily given a numerical value. The possibility to apply robust statistical techniques is one of the major advantages of the scale. Besides, the subjective nature of the scale gives a more realistic assessment of fluorosis. 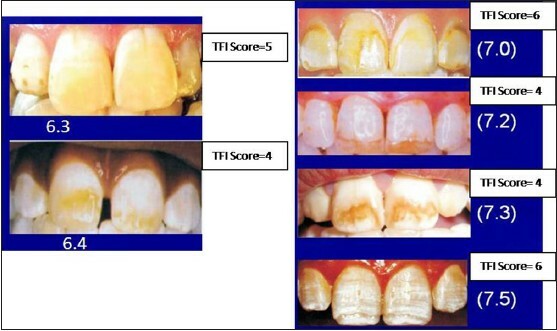 Photographic assessment of fluorosis, employed in the study could have resulted in mis-classification bias with respect to TFI scores. However, in the present study, such a bias was minimized by measures viz. standardization of photographs, coverage of only four teeth (maxillary right lateral incisor-right lateral incisor) and exclusion of canines due to inability to view disto-labial aspect owing to the distal rotation of canines. When selected teeth were included, photographic assessment of fluorosis have been proved to be valid and reliable. ,, Although, it is true that selective teeth assessment of fluorosis might have missed out higher scores on other teeth viz. premolars and molars which are many a time the most severely affected teeth, it is not of clinical significance as far esthetic concerns go. Comparison between scores rated by dental specialists and lay group was made and it was found that VAS scores rated by lay group and specialists varied similarly for all the photographs; however, it was noted that the specialists group rated higher scores on VAS, especially, the milder forms of fluorosis were rated higher by specialists than by the lay group. This was probably due to the interference of knowledge of fluorosis with perception among the dental specialists. The VAS was validated against modified TFI as it is the most sensitive of the currently available indices for dental fluorosis. ,,,, Modified TFI could be performed on selected teeth, allowing only buccal/labial surfaces to be scored  and hence was more suitable for the present study which involves photographic assessment of fluorosis. On validating VAS scores against modified TFI scores, Spearman rank correlation coefficient (ρ) value was estimated to be 0.725. 0.6<ρ>0.8 indicates moderate correlation. This implies that VAS measured what it intended to measure but not in the same way as TFI. Hence, the VAS is comparable to TFI and yet a simpler tool to assess dental fluorosis. The present study was conducted in Vadodara, Gujarat, which has been identified as an important fluoride belt in India. Therefore, the scale may be applied in other fluorosis endemic areas in India or other parts of the world with high prevalence and severity of fluorosis. However, the assessment of fluorosis in the study with the help of VAS reflects the perceptions of educated community as the lay group in the study was constituted by 1 st year dental undergraduate students. Whether the uneducated community in India perceives fluorosis similarly as rated on VAS developed in the study needs to be investigated. Besides, the sample in the present study was chosen nonrandomly, which warrants further validation of the scale on the general population prior to its application. The developed VAS is a valid and reliable tool for assessing the esthetic perception of fluorosis. Testing of the scale on a larger population is recommended prior to clinical or epidemiological use. 1. Burt BA, Eklund SA. Dentistry, Dental Practice and the Community. 6 th ed. Philadelphia: Elsevier Science; 2005. p. 287-93. 2. Ellwood RP, O'Mullane D. Enamel opacities and dental esthetics. J Public Health Dent 1995;55:171-6. 3. Kothari CR. Research Methodology. 2 nd ed. India: New Age International Pvt Ltd.; 2004. p. 69-82. 4. Limeback H, Vieira AP, Lawrence H. Improving esthetically objectionable human enamel fluorosis with a simple microabrasion technique. Eur J Oral Sci 2006;114 Suppl 1:123-6. 5. Vieira AP, Lawrence HP, Limeback H, Sampaio FC, Grynpas M. A visual analog scale for measuring dental fluorosis severity. J Am Dent Assoc 2005;136:895-901. 6. Martins CC, Chalub L, Lima-Arsati YB, Pordeus IA, Paiva SM. Agreement in the diagnosis of dental fluorosis in central incisors performed by a standardized photographic method and clinical examination. Cad Saude Publica 2009;25:1017-24. 7. Tabari ED, Ellwood R, Rugg-Gunn AJ, Evans DJ, Davies RM. Dental fluorosis in permanent incisor teeth in relation to water fluoridation, social deprivation and toothpaste use in infancy. Br Dent J 2000;189:216-20. 8. Tavener J, Davies RM, Ellwood RP. 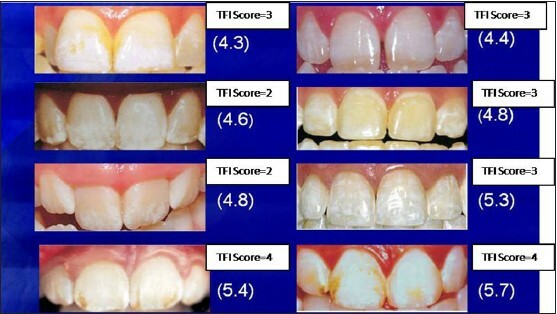 Agreement amongst examiners assessing dental fluorosis from digital photographs using the TF index. Community Dent Health 2007;24:21-5. 9. Portney LG, Watkins MP. Reliability. In: Portney LG; Watkins MP, editors. Foundations of Clinical Research Applications to Practice. New Jersey: Prentice-Hall; 2000. p. 61-75. 10. Ellwood R, O'Mullane D, Clarkson J, Driscoll W. A comparison of information recorded using the Thylstrup Fejerskov Index, Tooth Surface Index of Fluorosis and Developmental Defects of Enamel Index. Int Dent J 1994;44:628-36. 11. Pereira AC, Moreira BH. Analysis of three dental fluorosis indexes used in epidemiologic trials. Braz Dent J 1999;10:29-37. 12. Rozier RG. Epidemiologic indices for measuring the clinical manifestations of dental fluorosis: Overview and critique. Adv Dent Res 1994;8:39-55.